A Tuesday night trip to the Ridgeons Stadium in Newmarket to watch a potential title deciding match from the Cambridgeshire Women's Premiership under the floodlights, Newmarket Town Ladies v Cambridge United WFC Reserves. A meeting between two ambitious sides, both looking to win the Cambridgeshire Women's Premiership title this season. Not only only sides still in the title race however just a point separates the top 4 going into tonight's game. Cambridge United WFC Reserves a point in front head of the 3 sides below, Netherton United Ladies, Cambridge University Women and Newmarket Town Ladies who are in their lowest position ironically having been in the top two pretty much all season. Cambridge United WFC Reserves have 4 league games left to play, Newmarket Town Ladies 3 a win puts them back on top, for Cambridge United a chance to go 4 points clear of the rest, gain a huge advantage in the run in. Having already won the Junior Invitation Cup and then the League Cup just 4 days ago the treble very much on for the visitors. A smart state of the art cork based artificial pitch an opportunity to play under the lights. The weather changeable at the moment to say the least needed the suncream down in North London on Sunday, this evening on the way to the game the car was bombarded by hailstones, needed the umbrella albeit for 5 minutes as the rain stayed away after that the skies dark the temperature dropping rapidly. Opted for the covered stand beside the refreshment booth and clubhouse to view the game. Newmarket Town Ladies starting XI - Eloise Hope, Jess Linger, Olivia Orme, Yasmin Woodfield, Beth Woodfield (C), Antonia Smith, Cindy Ponder, Kristen Hummel, Abbi Griffin, Abbie Marshall & Nadine Basson. subs - Laura Bailey, Jordanne Sillitoe, Kate Winnewisser & Lauren Deller. Cambridge United WFC Reserves starting XI - Sarah Carroll, Emily Ingle (C), Emma Roberts, Liz Pamplin, Carolyn Sarafian, Tahnee Perfect, Gabrielle Whitehurst, Lucy Gateson, Teonie Payton, Ebony Rule & Lauren Gibson. subs - Ellen Green, Kirsten Burt & Kirsty Geal. A challenging match report tonight as one side had no numbers upon their shirts & I use numbers for my notes... most of the time. 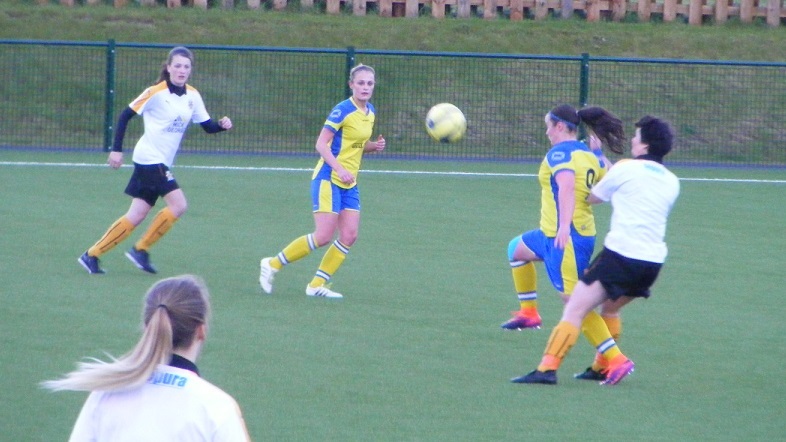 A smart looking new white skirt with amber trim across the shoulders for Cambridge United WFC Reserves only upon picking the shirts up the numbers had yet to be added along with black shorts and amber socks. Thankfully I had seen them twice recently in both finals and was confident of getting most right. It's Cambridge to get the game kicked off 1st half. Know most of the Newmarket squad too so had they had no numbers on their shirts either I'd have managed, as it was they did lined up opposite wearing yellow shirts with blue trim, blue shorts with a vertical yellow stripe on the sides with yellow socks with two blue and white hooped bands. Newmarket put pressure on the ball in midfield straight away, winning it Antonia Smith plays the ball out to the right on the diagonal for Abbi Griffin moving forwards bringing the ball down into her stride looks to drive inside into the box, Cambridge's Carolyn Sarafian comes in across her run to tackle and send the ball out for a throw in. 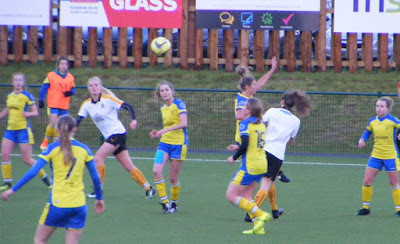 Moments later the ball is in the back of the net, Newmarket pressing on the right, Abbie Marshall sending a high looping ball into the air heading towards goal goes over her as she goes down under challenge the referee gives a foul against Newmarket. Jess Linger playing at right back gets forwards for Newmarket plays a long ball on the diagonal in towards the far post, Marshall closing in, Cambridge captain Emily Ingle heads the ball to safety. Newmarket send the ball up field into striker Nadine Basson 30 yards out seeing the ball down off her chest turns and sends the ball on into the area, Cindy Ponder making the run going right strikes the ball 1st time her effort whipping behind the goal. Cambridge striker, Lauren Gibson very nearly capitalises as she charges down a back-pass played into Newmarket goalkeeper Eloise Hope just inside her area the keepers clearance smashing against Gibson dropping to her left she gets to it before Hope shooting before the keeper can recover pulls he effort wide of the near post. An end to end start to the game, Sarafian stops Newmarket's Nadine Basson at one end brings the ball out plays it up through the middle with Ebony Rule timing her run perfectly, Hope comes rushing out to meet her as she enters the box makes the blocking save as she pulls the trigger. Newmarket try to get Marshall clear on the right wing, Emma Roberts tackles the ball out for a throw level with the top of the box, Kristen Hummel heads the ball on dropping into Basson's feet right corner of the box she looks to drives across the box find a half a yard to take a strike, Teonie Peyton slides in to win possession for Cambridge. The ball with Ingle on the right goes long again with Rule on the move early beating the offside trap taking the ball on through the middle, Yasmin Woodfield has the extra pace in her legs to catch Rule up puts her right foot in to take the ball from the striker as they enter the box. Cindy Ponder brings the ball over halfway on the right side for Newmarket, Basson receives it into her feet laying in off to Griffin inside her before going on to run in behind into the area right of goal Griffin's return pass finds her, Sarafian comes across lunging in to put the ball away for a through in the corner. Penalty! From the resulting throw sent up into the area right side an infringement is spotted by the referee who points to the spot, a penalty awarded to Newmarket in the 11th minute. Ponder sets the ball down on the spot, hits it straight down the middle and straight at goalkeeper, Carroll who holds on to it comfortably to save. Cambridge build an attack down the left, Peyton getting the ball into the area as she goes to ground, Rule left side puts a cross along the top of the six yard box finds Lucy Gateson doesn't connect cleanly with the ball screws away from goal, Hope throws herself at it smothering the ball ending the move. 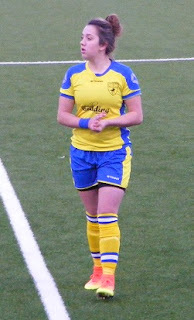 Peyton is struggling holding the back of her thigh he night is over as she comes off limping, Kirsty Geal recently signed by Cambridge comes on to take her place on the left wing. Hummel over on the left side runs in towards the top corner of the area sends a diagonal ball into the area for Griffin far side knocking the ball in closer to goal looks to hit her shot hard, Carroll across her goal saves at close range at her near post. Basson having taken a knock a few minutes ago has come off for Newmarket. 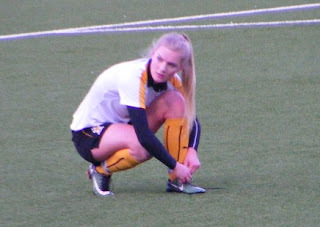 Gibson taking the ball forwards for Cambridge puts it into Rule back to goal inside the box good hold up play as Tahnee Perfect gets in behind overlapping Gibson, sends a cross high into the box, Newmarket captain Beth Woodfield gets up to head the ball behind for the corner. GOAL! Cambridge take the lead from the corner kick the delivery good a high ball dropping into the six yard box near post Gibson has evaded her marker gets up unchallenged to head the ball down past Hope into the back of the net 0-1 midway through the 1st half. A free-kick for Cambridge inside the Newmarket half on the left, Geal over it sends the ball long in towards the far post bouncing inside the six yard box Gateson has made a late run just can't get a touch on the ball as it runs out of play. GOAL! Moving into the last 5 minutes of the 1st half Cambridge double their lead is a superb strike by Gibson at the top of the area as the ball is flighted into her from the right, leaning back as it drops onto her foot turns hitting the shot first time the ball looping up curling past Hope into the goal beyond. 0-2. Newmarket push on as the 1st half moves into stoppage time, Griffin onto a long crossfield ball on the right brings it down looking to take the ball into the box Geal blocks conceding a corner. A good ball in, Winnewisser coming to met the ball six yards out near side gets a firm header in the ball directing it on across goal goes wide at the far post. A 2-0 lead for Cambridge at the break, Gibson scoring both finding space for both goals from good deliveries after Newmarket missed the opportunity to take the lead from the penalty spot. A good tempo to the game both side looking to get their wide players on the ball, Cambridge happy to sit deeper break up an attack little room for Newmarket to get into the box at 2-0 however the game is delicately balanced, the next goal a vital one for whoever can score it. Newmarket kick-off the 2nd half, have made two changes at half-time with both Laura Bailey and Lauren Deller on the field. The home side get the ball into the final 3rd right from kick-off, holding it up on the right wing before winning a free-kick players pile into the area a good ball into the middle of the six yard box, Sarafian winning the header clears the ball out of the box. Newmarket keep possession are camped in the Cambridge half in the opening minutes without finding an clear chance to send the ball in towards goal. An opportunity for Cambridge to break the ball slid through to Gateson coming inside from the right drives fro the area, Beth Woodfield coming across putting in a strong tackle to win the ball as Gateson goes to pull the trigger. From the resulting corner kick the ball is headed out of the six yard box by Ponder goes back to Gateson out wide having take the corner looks to shift the ball down the line plays her cross in behind goal. Ingle bringing the ball on fires it up into the box looking for Rule back to goal 10 yards out holds up well spots Perfect coming towards her outside the box rolls the ball towards her, Perfect connects 20 yards out sending a rasping ball in towards goal, Hope makes a fantastic save diving to her right getting a glove on the ball pushing it wide, then recovers quickly as Gibson going after it turns inside and tries to put in it from an acute angle Hope jumping claims the ball. Perfect plays the ball into the run of Gateson on the right, looking to twist inside as she moves into the box is tackled by Newmarket's Olivia Orme. A good spell for Cambridge as they keep possession inside the Newmarket half. Basson is back on the pitch for Newmarket replacing Ponder. On the ball drives on through the middle, Griffin to her right plays the pass towards her sliding in to win it top of the area Roberts blocks for Cambridge. Marshall returns to the action for Newmarket going left side replacing Bailey. Cambridge bring off Gateson sending on Kirsten Burt. A great take down inside the D from the substitute as Burt the ball is played in long from the left, controlling well turns putting the ball past Hope runs narrowly wide. A free-kick for Newmarket on halfway as Marshall is fouled, the ball is cleared, Roberts catching it full on the face, a little dazed shrugs it off however carries on without needing treatment. Rule goes on through the middle after the ball played in over the top by Whitehurst, Hope comes racing out to meet her Rule 1st to it lobs the keeper, Hope turns sees the ball drop wide of goal. GOAL! 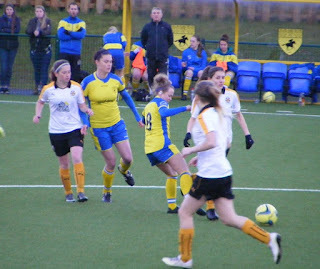 Not long after Cambridge go on to extend their lead the ball played in by Perfect dropping into the box left side of goal, Gibson peeling in behind the Newmarket defence wins the race for the ball as Hope comes sliding in the striker also going to ground sliding the ball past her and into the far corner of the net to complete her hat-trick. 0-3. Jordanne Sillitoe comes back on for Newmarket to replace Griffin on the right. Hummel is played in on the right into the box takes a touch before drilling the ball into the side netting. Pushing forwards Newmarket squeeze the Cambridge defence, Linger on for Sillitoe puts the cross in along to top of the area, Pamplin heads it down out of the area, Marshall goes to strike the ball Roberts charging it down, a 2nd opportunity for Marshall, gets it through the Cambridge defence this time, Carroll can see it run wide of her goal. Roberts come off for Cambridge, Ellen Green coming on. A free-kick for Cambridge wide right level with the top of the area Burt on the ball sends an inswinging ball in towards the centre of goal, Sarafian running onto it jumps to header as Hope looks to get up claim, Sarafian bundling the keeper over the ball ending up in the back of the net the referee giving the free-kick to the injured goalkeeper who needs a few moment to recover. Basson drives on with the ball right side knocking it on into the box, slides in to reach it before Carroll her effort racing wide across goal. Into injury time Newmarket come on Smith onto Hummel lays it out to Marshall ready to break into space on the left is brought down a late free-kick fired up into the area, Sarafain in the mix heads the ball clear as the referee brings the match to an end. Cambridge United WFC Reserves win 3-1 to go 4 points clear at the top of the Cambridgeshire Women's Premiership a hat-trick from Lauren Gibson taking her to 14 for the season. Leading 2-0 at the break went on to get the 3rd as Newmarket pushed them hard, drawing the 2nd half 1-1. Puts them in the driving seat for the title now, difficult for Newmarket to close a 4 point gap with just 2 games left Cambridge still have 3. All very much to play for with 2nd to 4th all still on 24 points. 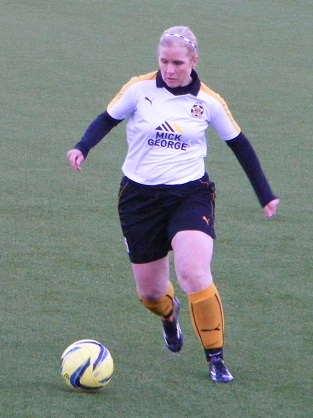 Tonight's SWF Blog - Player of the Match goes to Cambridge United WFC Reserves defender Carolyn Sarafian. Has featured for both the Reserves and first team in their recent finals good performances in all came close on Friday, has maintained a high level of performance during that period. My thanks to both sides for the squad details, I wouldn't recommend sides playing without shirt numbers mind but it was a side I know fairly well. Good luck to both sides in their final league games.